Whether you’re the blushing bride-to-be or the excited groom, sending out your wedding invitations is a momentous occasion. Suddenly, months of wedding planning seem real once those wedding invitations get sent out by mail – not to mention you finally get to experience the thrill of inviting loved ones to share your special day with you. But before you place a stamp on your wedding invitation, ask yourself this crucial question: do your invites include all the must-have information your wedding guests need to know? If you’re not sure what crucial information your wedding invitations need, not to worry: we’ve outlined the information that should appear in your invites. So grab a cup of coffee, sit back, and enjoy your momentary escape from wedding planning stress! The Date, Location, and Time: Be sure to provide an address of the location. It can be easy to assume that your guests will use their GPS to get to the wedding, but you don’t want to isolate those guests who may not use these technologies. The Dress Code: Many wedding invitations fail to spell out what the dress code of the ceremony and reception will be. Don’t let your guests risk a fashion faux pas; be sure to spell out if the wedding is a black tie affair, a casual beach party, or a white tie extravaganza. The Wedding Registry: Your guests will want to shower you and your fiancé with gifts; make sure they know where to go! How to RSVP: Your wedding invitation should include information as to how your guests can RSVP. Make sure you include an envelope with an RSVP card that your guests can send back to you. Of course, include the date you’d like to receive all the RSVPs – and make sure you plan it so you leave a couple of weeks before you have to give a headcount. Once your wedding invitations have this must-have information, you’re ready to send out your invites to your loved ones! Make sure you check out our wide selection of wedding invitations here, and don’t forget to ‘like’ us on Facebook to get up to 25% off your save the date cards! Offer ends August 31, 2012, so don’t miss out on this incredible deal! There’s no denying that a bevy of wedding invitation choices lay before you and your fiancé. You can choose almost any design or invitation style your heart desires, not to mention paper choices, card sizes and printing options. But for some couples, the wedding invitation is more than just a way of providing ceremony and reception information to their loved ones…it’s an opportunity to demonstrate their unique relationship. It’s no surprise that more couples are opting to make their own wedding invitations or are searching for unique invites that match their unique personalities. If you’re interested in doing something special for your wedding invitations, here are some ideas that you and your fiancé can use. By nature, wedding invitations should always be personalized (after all, people need to know who’s getting married!). But with regards to personalized invitations, we mean finding the kind of invitations that truly speak to you and your sweetheart as a couple. For example, if you and your fiancé are always off hiking, you could opt to design a wedding invitation that centers on fall foliage or a forest appearance. You could also opt to personalize your invitation with a your very own custom design. These types of wedding invitations are becoming increasingly popular, as they make the invites feel more special and meaningful since they are designed just for you. Be sure to ask your wedding invitation designer for their custom design services. There’s no denying that wedding invitations are getting more creative and unique with each passing year. There’s a plethora of options out there for you and your fiancé to pick from – and if you’re having a theme wedding, you have a wonderful opportunity to make your wedding invitations special and meaningful. For example, if you’re having a destination wedding, you could opt to have your wedding invitation printed to look like an airline ticket. If you’re having a beach-themed wedding, your invites could have a nautical design. While these are specific examples, they’re meant to demonstrate that when it comes to special wedding invitations, the world is your oyster! At Save The Date For Less, we make it our mission to provide you with special and meaningful wedding invitations that won’t break the bank. Whether you’re having a traditional wedding or a themed ceremony, we have the perfect invitations for you. Browse through our selection now or contact our Custom Design department to speak with our talented graphic designers – and let us help you save the date for less! Also, don’t forget to ‘like’ us on Facebook to get up to 25% off your save the date cards! This offer ends August 31, 2012, so don’t miss out on this incredible deal! Do I Really Need a Directions Card in My Wedding Invitation? Let’s face it: you can’t wait to send out those wedding invitations. You can’t wait for the RSVP cards to start pouring in as you and your sweetheart prepare to begin the journey of a lifetime. You’re ready to let friends and family members know that you’re delighted to include them in the happiest day of your life. But before you send out those wedding invitations, there’s a pivotal question you might have asked: Do I really need a directions card in my wedding invitation? Not Everyone Has a GPS. It seems inconceivable in today’s day and age that anyone would be without a GPS. However, those people still do exist – and they’re likely comprised of older members of your family. Not including a directions card in your wedding invitation means you might make Grandma or Great-Aunt Lillian go through the stress of having to search for directions. A Local’s Knowledge is Incomparable. In an ideal world, most wedding venues will be clearly marked and located off a main road. However, with more couples getting married in gorgeous farm fields and rustic locations, you can’t guarantee that a GPS will always take your guests to the right location. Pointing out that your guests should take the second right after the first lamppost is an important direction that a GPS just can’t provide. The bottom line is this: while a large majority of your wedding party will only need a GPS, you don’t want to risk excluding older members of your family or those without GPS. Similarly, if your wedding is in a hard-to-reach location, you can’t always trust that a GPS will get your guests there. 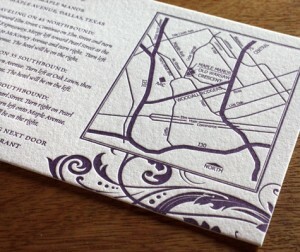 Your best option is to eliminate the doubt by including a directions card in your wedding invitation. 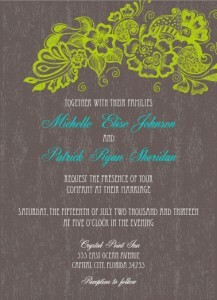 Visit SaveTheDateForLess.com today to discover special designs and a wide selection of wedding invitations. You can even order matching wedding insert cards, which are perfect for displaying directions to the ceremony and reception. Also, don’t forget to ‘like’ us on Facebook to get up to 25% off your entire order! Offer ends August 31, 2012, so don’t miss out on this incredible deal!